Clawfoot Tubs are more popular than ever. They evoke feelings of a time which has all but slipped away. 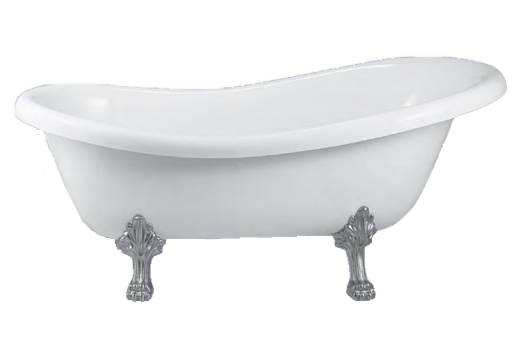 Today's clawfoot bathtubs are offered in vintage styles yet constructed of materials which are more suited to today's lifestyles. Here we have gathered a collection of clawfoot tubs made of durable, double shelled, acrylic as well as tubs made of a proprietary product; AcraStone®. When we say "double shelled" we mean each of these tubs is constructed with two shells, an inner shell and an outer shell, which have been bonded together giving these tubs a smooth and glossy shine on the inside and out. Being double shelled also means these tubs have great insulating properties. 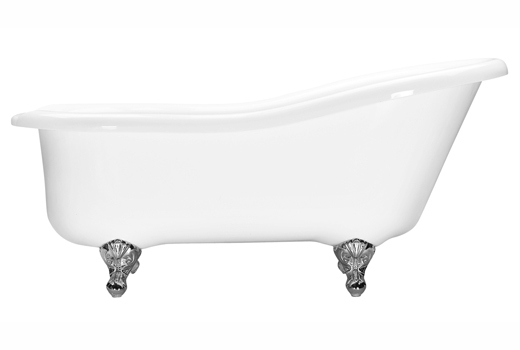 Most of our tubs have the look of a porcelain tub. You often can't tell until you actually feel it. 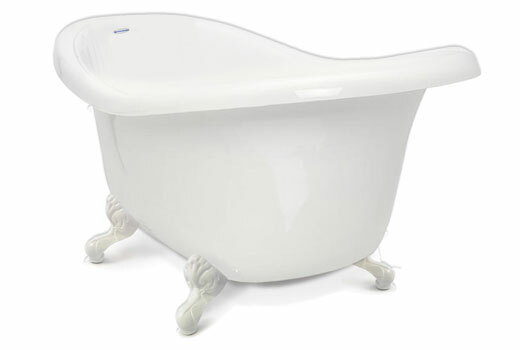 Our clawfoot bathtubs come in a wide range of sizes and styles, ranging, in length, from just 54" all the way up to 72". 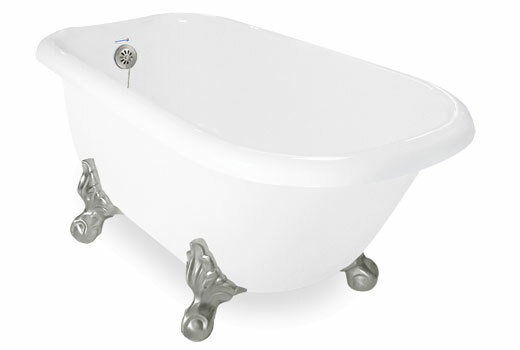 We have classic roll-tops, slipper tubs, double slipper tubs, as well as the dual ended roll-top tubs. 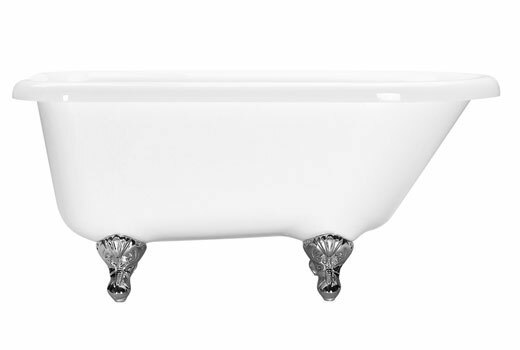 You may choose to go with a classic white tub with white feet which would lend itself nicely to a chic farmhouse style bathroom or go a little more bold by selecting something like our Delilah 7240CF Dual Ended Clawfoot Tub, 72" x 40", with a classic white interior and a bold black exterior. Whatever you choose we are sure you will be pleased. 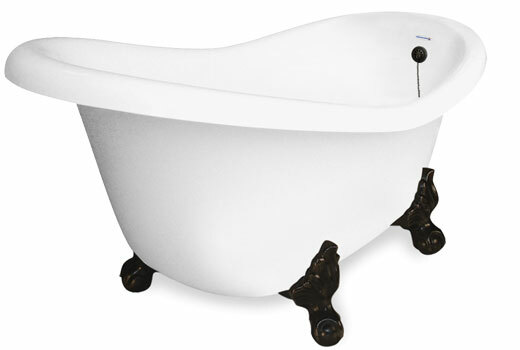 There are several styles of clawfoot tubs. When we are speaking with clients we often find they aren't quite sure of the terminology to describe the style of tub they prefer. 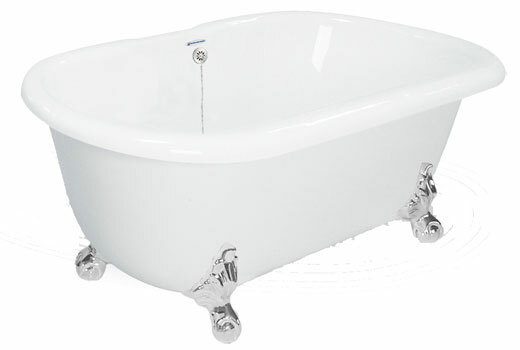 There are the Classic Roll-top Clawfoot Tubs which are rather flat across the top. No real rise or fall to the rim except, on some, where there may be a flattened spot to accommodate a deck, or rim, mount tub faucet. Most of these will have the drain drilled at the foot end of the tub. 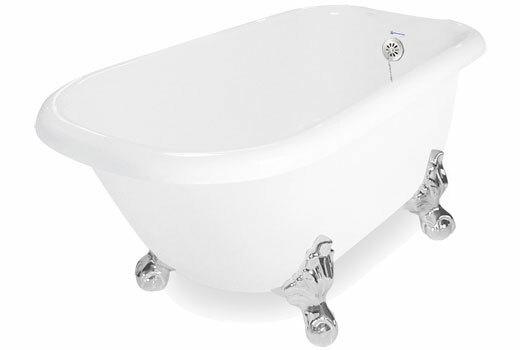 We then have the Clawfoot Slipper Tubs and Double Slipper Tubs. A standard slipper style tub will have one end which is raised giving it the appearance, from the side, of a ladies high heeled shoe. 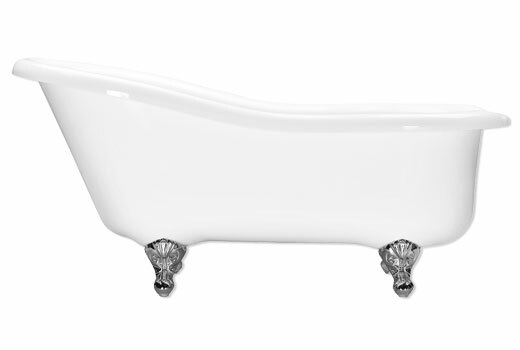 The drain on this type of tub will be at the low end, or foot, of the tub. The high end of this style tub provides support for your back and sometimes, depending on an individual's height, your head. A Double Slipper Tub will be raised at both ends. 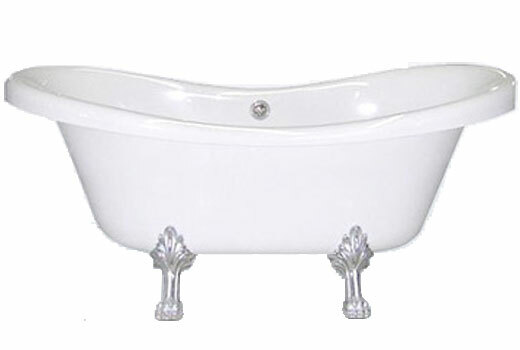 The Double Slipper Tub, or Dual Ended Slipper as it is sometimes called, is often seen as a two person tub when, in actuality, that depends very much on the size of the bathers. 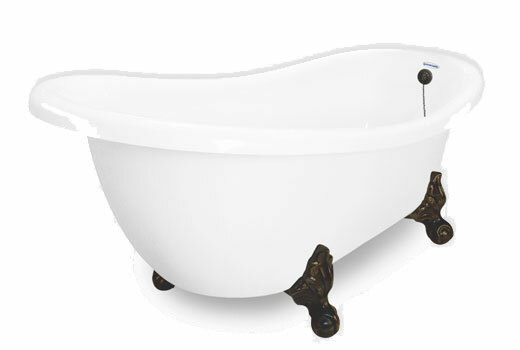 Slipper tubs, by design, are typically smaller on the interior due to the sloped shape taking away from the interior bathing well length. 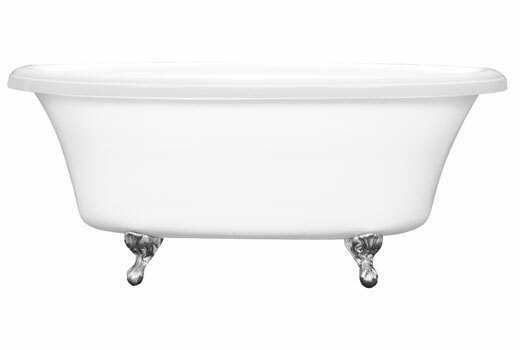 Last, but certainly not least, we have the Dual Ended Clawfoot Tubs. 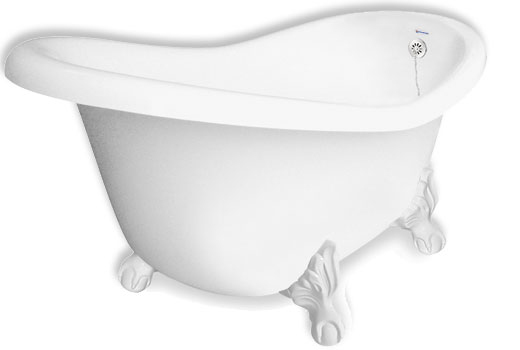 These tubs are also often considered to be suited for two bathers. Again, always refer to the technical data sheets for a specific tub to determine the size of the bathing well. 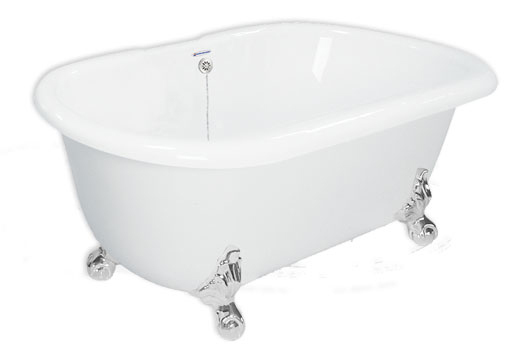 Dual Ended Clawfoot Tubs, like the double slipper tubs have two symmetrical ends. 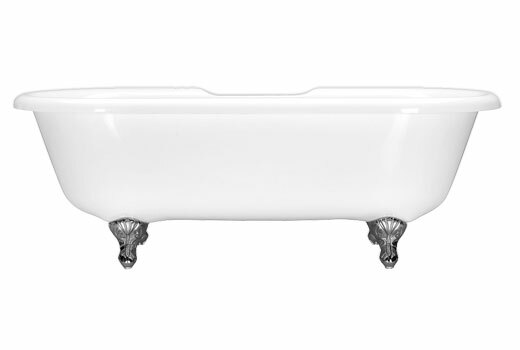 The Dual Ended Clawfoot Tub will usually have the drain located in the center of the tub. Some have them centered not only in the length but also centered in the width. It's a good idea if purchasing a tub with a center drain to go with one of our drains (usually a tip-toe or trip-lever style) which does not have a cap or knob which will stick up in the middle of the tub. All clawfoot tubs are not created equally especially when it comes to size. 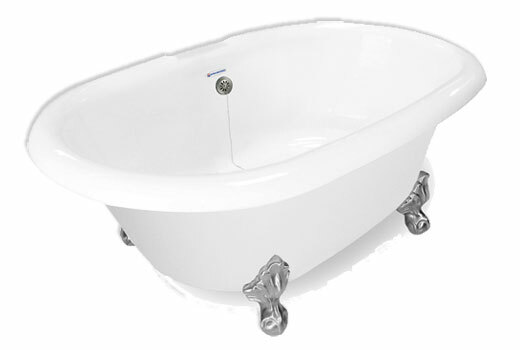 Due to differences in design two 60" tubs can vary greatly when it comes to the interior. For instance, we've seen two 60" tubs, by the same manufacturer, sitting side-by-side. One a classic roll-top and the other a clawfoot slipper tub. In the 60" roll-top a 6' foot tall man was able to sit with his legs stretched out. In the 60" slipper tub a 5'2" woman sat and her feet nearly came to the end of the tub. Of course two people of the same height will not always be proportioned the same. One may have a longer torso, the other longer legs so it's really important to look at the individual tub spec sheet, paying close attention to the interior dimensions. A good way, we've found, to get an idea of how a particular tub may suit you is to look at the interior length of the tub shown on the spec/technical sheet. Find a spot where you can sit with your back up against a wall. Measure out from the wall the distance of the interior length of the bathing well of the tub. See where your feet are in relation to the interior bathing well length. This will give you a basic idea of how much room you will have. 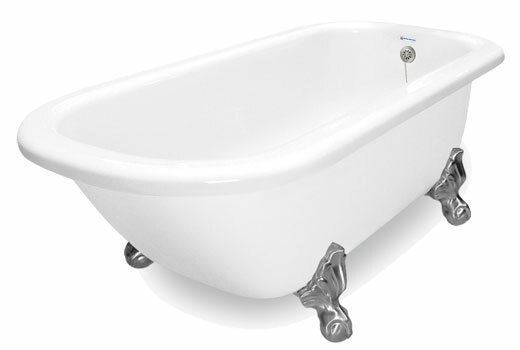 Keep in mind, most of the time, our manufacturers have marked the bathing well length by measuring only the flattest part of the tub floor. Most tubs do not just jut straight upward. There is usually some gradual roll to the bottom so, typically, you do have a little more room than what the measurement shows. We'd also like to add that the exterior, overall, measurements of the tubs are measured outside lip to outside lip. As always, please feel free to give us a call should you need any help. 54" X 30" X 24"
54-3/8" X 30" X 24-1/2"
60" x 32.5" x 30"
60" X 30" X 24"
60" X 31-1/2" X 30-1/4"
60" X 32" X 24"
60" X 32-1/2" X 30"
66.5" X 32.25" x 28"
66" X 33-1/2" X 30-1/2"
66" X 38" X 29"
67" X 30" X 23"
67" X 32" X 30"
70" X 32" X 24"
71" X 35" x 30"
71.5" X 39" X 25"
71.75" X 39-5/8" X 39-5/8"
72" X 31" X 28-1/4"
72" X 42" X 27"
Copyright © 2003 - 2017 | The Bath Spot | All Rights Reserved. | All prices subject to change without notice.